And light them he certainly does in this beautiful Paddington big screen adaptation. Beginning as a brief origin story, we find a nameless explorer intrepidly hiking through the Peruvian jungle with only the bear essentials. Chancing upon a family of bears, instead of doing the traditional thing of killing and shipping them, he befriends them, studies them and of course, teaches them the benefits of marmalade. Fast forward some years and an earthquake leaves a young bear and his aunt to fend for themselves. Before heading off to a home for retired bears in Lima, Aunt Lucy deposits her charge at the docks with a suitcase full of marmalade, a red hat and tag bearing the words 'Please look after this bear'. Sure he will find a family to look after him in London, the bear sets off on his voyage. Of course, London has changed a bit since the old days and arriving at Paddington station the young bear's attempts to be very polite and talk about the weather to a train platform full of commuters fall somewhat flat. That is until he chances upon the Browns. Mr. Brown (Hugh Bonneville) is a risk analyst and a bit grumpy, Mrs. Brown is Sally Hawkins and therefore utterly lovely, and the two kids are embarrassed (Madeleine Harris' Judy) and geeky (Samuel Joslin's Jonathan). Against Mr. Brown's advice, Mrs. Brown offers the bear a home for the night until they can work out what to do with him. Attempts to pronounce his bear name prove too difficult so the young bear is given an English version - Paddington. I really have absolutely no way to find any fault with this gorgeous, charming, perfectly cast, witty, hilarious, brilliantly animated movie. So let's just work through those things and see if I can add anything to persuade you to go and see it. I'll take the bear first. Director Paul King's Paddington is slightly lankier, slightly longer of nose and slightly more bear like than his stuffed equivalent. Not that any of that matters a bit, he's an absolute delight. The effects department have worked wonders on the character, not for a second does he stand out as an effect, whether he is barreling out of control on a skateboard or receiving a very thorough washing up, every hair is perfectly rendered. The duffle coat arrives a bit late but once it does, this is absolutely the Paddington bear you remember. Ben Wishaw's voice work is likewise spot on, just soft enough to portray his innocence but not so soft as to make you think he couldn't make his way in London. The remainder of the cast is pretty much a list of national treasures. Julie Walters, Jim Broadbent, Peter Capaldi, Matt Lucas, Geoffrey Palmer, Michael Gambon, Imelda Staunton all present and correct and all having a superb time. Nicole Kidman fills the only international element not from Darkest Peru and likewise has a huge amount of fun as the wide-eyed lunatic taxidermist working at the Natural History Museum. Actually, I have found something to fault in this movie. I'm sure they refer to it as the British Museum at some point which is a different place. There. That is literally the only thing wrong with this movie. The script is every bit as good as the casting and the animation. Filled with kinetic set-pieces, generally based around Paddington trying to make good with something, that will entertain both children and the adults they've dragged with them to the cinema. And that of course is the absolute charm of this movie. King manages to throw in enough adult friendly references to keep the grown ups from wriggling in their seats, whilst never leaving the kids with any time to get bored. Paddington's arrival has a transformational effect on the Brown's existence and well worn themes are explored with a relentless enthusiasm. In terms of the property, King and his team have also ticked every box. 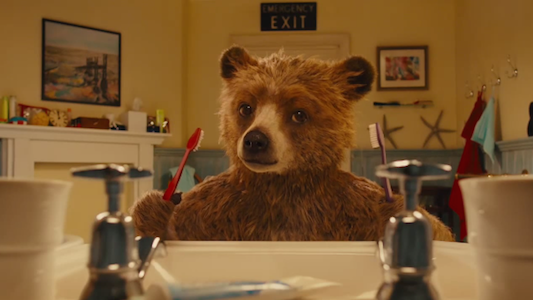 Wishaw's Paddington is faultlessly positive and polite, his hard stares when he thinks somebody is being impolite, his emergency marmalade sandwich spends the whole movie under his hat and the central theme of an outsider finding a place in London is set perfectly. The movie's humour and downright decency stop the few moments of sentimentality from becoming an issue. Framed wonderfully in a shiny, tourist friendly version of London, where pickpockets hark back to the old days of cheeky chappie rogues and the sight of a bear in a police hat being towed behind a bus only leads to the local coppers rushing to their 'colleague's' assistance, the story is as current as ever. I struggle to remember the last time I was as bereft of negative thoughts towards anything at all as I am towards Paddington. Not only the perfect Christmas movie (it doesn't reference the season, though there is snow), this is pretty much a perfect movie. Funny from start to finish, warm, accessible, honest and endlessly charming, if you haven't left for the cinema to catch this halfway through this review, go, go now.